Definition at line 101 of file llfloaterpreference.h. Definition at line 325 of file llfloaterpreference.cpp. Definition at line 366 of file llfloaterpreference.cpp. References mPreferenceCore, NULL, and sInstance. Definition at line 382 of file llfloaterpreference.cpp. Referenced by onBtnApply(), and onBtnOK(). Definition at line 388 of file llfloaterpreference.cpp. Definition at line 373 of file llfloaterpreference.cpp. Definition at line 458 of file llfloaterpreference.cpp. References apply(), LLFocusMgr::getKeyboardFocus(), gFocusMgr, LLUICtrl::hasFocus(), and LLUICtrl::onCommit(). Definition at line 474 of file llfloaterpreference.cpp. References cancel(), LLFloater::close(), LLFocusMgr::getKeyboardFocus(), gFocusMgr, LLUICtrl::hasFocus(), and LLUICtrl::onCommit(). Definition at line 425 of file llfloaterpreference.cpp. References apply(), LLFloater::canClose(), LLFloater::close(), CRASH_SETTINGS_FILE, FALSE, gCrashSettings, gDirUtilp, LLDir::getExpandedFilename(), LLFocusMgr::getKeyboardFocus(), gFocusMgr, gSavedSettings, gSettingsFileName, LLUICtrl::hasFocus(), LL_PATH_USER_SETTINGS, llendl, llinfos, LLUICtrl::onCommit(), LLControlGroup::saveToFile(), and TRUE. Definition at line 418 of file llfloaterpreference.cpp. Definition at line 330 of file llfloaterpreference.cpp. References LLPanel::checkRequirements(), FALSE, LLUICtrlFactory::getButtonByName(), LLPanel::getChildByName(), LLUICtrlFactory::getTabContainerByName(), mAboutBtn, mApplyBtn, mCancelBtn, mOKBtn, mPreferenceCore, onBtnApply(), onBtnCancel(), onBtnOK(), onClickAbout(), LLPanel::requires(), LLButton::setClickedCallback(), sInstance, TRUE, WIDGET_TYPE_BUTTON, and WIDGET_TYPE_TAB_CONTAINER. Definition at line 395 of file llfloaterpreference.cpp. References _PREHASH_AgentData, _PREHASH_AgentID, _PREHASH_SessionID, _PREHASH_UserInfoRequest, LLMessageSystem::addUUIDFast(), LLFloater::center(), gAgent, LLAgent::getID(), LLAgent::getSessionID(), gMessageSystem, LLUUID::isNull(), LLFloaterPreference(), LLMessageSystem::newMessageFast(), LLMessageSystem::nextBlockFast(), LLFloater::open(), LLAgent::sendReliableMessage(), and sInstance. Referenced by LLShowFloater::handleEvent(), LLPanelLogin::handleKeyHere(), and LLPanelLogin::LLPanelLogin(). Definition at line 491 of file llfloaterpreference.cpp. References mPreferenceCore, LLPreferenceCore::setPersonalInfo(), and sInstance. Definition at line 123 of file llfloaterpreference.h. Definition at line 126 of file llfloaterpreference.h. Definition at line 125 of file llfloaterpreference.h. Definition at line 124 of file llfloaterpreference.h. Definition at line 119 of file llfloaterpreference.h. 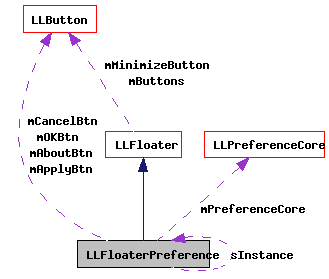 Referenced by apply(), cancel(), postBuild(), updateUserInfo(), and ~LLFloaterPreference(). Definition at line 133 of file llfloaterpreference.h. 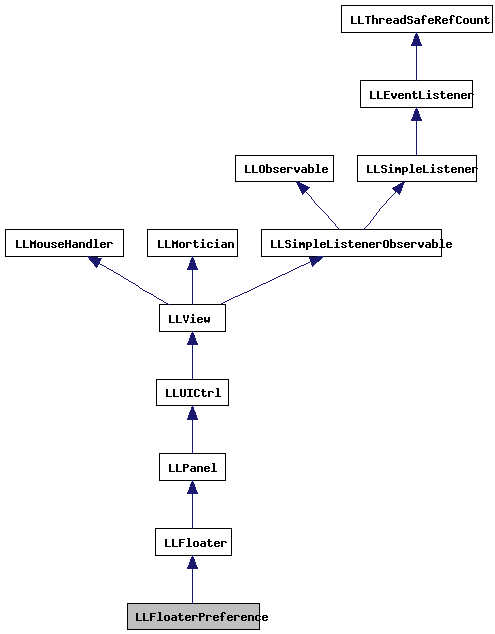 Referenced by postBuild(), show(), updateUserInfo(), and ~LLFloaterPreference().